During the past 15 years, multiphase pumps have gained increased acceptance in oil field production. They have replaced conventional production equipment with their simple and more economical technology. Multiphase pumping helps to eliminate separators, compressors, individual pumping equipment, heaters, gas flares and separate flow lines, hence, improving production at lower costs. An additional benefit is the reduced environmental impact for onshore installations. The small footprints requiring only a fraction of the space conventional equipment needs and the ability to handle gas in a closed system instead of venting and flaring guarantees low emissions and contributes to the increasing consciousness for our environment. Their ability to pressure boost the well flow to remote centralized processing units and to handle very low inlet pressures make multiphase pumps an ideal tool to develop marginal fields. The cost of separation equipment installed at the well sites could exceed the revenues gained from production by far. Especially on ageing fields the expenses for artificial lifting and field treatment can render a production site uneconomical. In old fields, the oil production drops and the water cut and gas-to-oil ratio (GOR) increases. While conventional production technology requires a constant modification of the field equipment to cope with the changing conditions, the large operating window of multiphase pumps allows a flexible reaction on changing well conditions. Already plugged and abandoned wells may return to production with multiphase pumping technology. The reduction of the well head pressure will allow the well to keep producing and the investment is paid off by the production very quickly. Today, both positive displacement pumps and helicoaxial pumps have been successfully used in multiphase applications onshore, offshore or sub-sea. 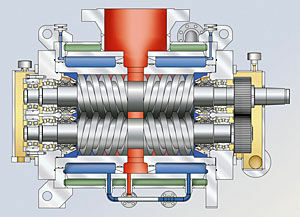 Among the positive displacement pumps, twin screw pumps are dominant. They can handle considerably high flow rates and pressures at a high gas volume fraction (GVF) and tolerate GVF fluctuations. Usually, the GVF can be as high as 95 to 98 percent at inlet conditions. Additionally, longer gas slugs can be expected with marginal field applications. In order to maintain internal sealing for the compression of the gas phase, a small quantity of liquid must be provided during the entire operation. This can be achieved by either an internal system which tolerates short gas slugs only or an external recirculation system which can be sized for gas slugs of 30 minutes or more. External recirculation systems are located upstream the pump discharge within the skid limits. Beside their ability to cope with long gas slugs, external recirculation systems usually operate without additional cooling requirements and can be cleaned from solids sediments without disassembling of the pump. Twin screw multiphase pumps can handle a wide variety of well fluids such as emulsions, waxy crudes, bitumen and sand-laden extraheavy crude. This is an especially important feature when the quality of the produced crude oil decreases. In areas with low temperatures in the winter months, multiphase pumps can be used for hydrate control and prevent a field shut-in during this period. Twin screw multiphase pumps are available as low pressure pumps up to approximately 30 bar (450 psig) differential pressure and as high-pressure pumps up to 90 bar (1,300 psig) differential pressure. Depending on the actual operating parameters, a maximum flow rate of 2,000 m3/h (300,000 bbl/d) can be achieved. To determine the actual performance of a multiphase pump, the liquid phase and the gas phase have to be re-calculated to get similar flow denominations. The gas formulas are used to convert the gas flow from scf/d into bbl/d, always considering the actual inlet conditions (pressure, temperature etc.). These calculations basically determine whether a multiphase pump can be used for a particular application. In case of very high gas to liquid ratios (GLRs) the use of a compressor may be a more economical option. The possibility to vary the pump speed between approximately 30 and 130 percent of the design speed make twin screw multiphase pump a versatile equipment. Inverter driven electric motors make it possible to adjust the pump unit easily to the changing well or field conditions. For remote installations such as offshore wellhead platforms, diesel or gas engines can be used as optional drive systems. 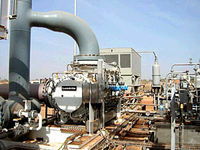 Multiphase pumps are often found in applications where sour gas (H2S) or CO2 form additional hazards. For these applications special care must be take during the pump selection process. The selection of the wetted construction materials must follow the current NACE requirements and special attention must be given to the mechanical seals. While for standard applications single seals with or without liquid quench can be used, double seals are usually first choice for sour gas applications. These seals are flushed by external systems (such as API plan 53) which prevents the leakage of the hazardous gas into the atmosphere. When the well fluid carries a high amount of abrasive solids, the construction materials must be selected particularly careful. Special surface treatment of the pumping elements may be necessary as protection against excessive wear. 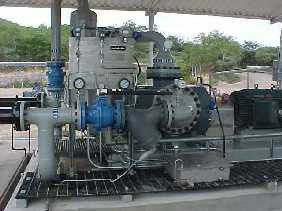 Typically, multiphase pumps are installed in remote locations. They can be found on well head platforms offshore, on onshore field far away from the production facilities or subsea. The installations are usually unmanned and require rugged and reliable equipment. Such multiphase pump packages include beside the pump and drive, block valves, check valves, strainers, pressure relief valves, lube and seal oil systems, on-skid piping and interconnecting piping between the particular skids. For applications with high GVF or where long gas slugs are expected, an external recirculation unit must be part of the system to guarantee trouble-free operation. The installed skid instrumentation allows monitoring of the actual operating conditions and either local or remote adjustment. Another important factor is the availability of redundancy. A spare pump should always be installed to guarantee continuous production. During the past years, multiphase pumps have gained vast acceptance among the oil producers. On various installations in North America, they kept mature oil fields alive and producing. In Colombia, twin screw multiphase pumps were installed on an oil field which had been producing for 25 years. In a mountainous terrain, the central processing facility had been erected on the highest elevation, while most wells were located in the valleys. The high well pressures and later, the use of ESP’s provided sufficient production to the hilltop facilities. The ageing wells, however, with increased water cut due extensive water injection could not flow back sufficient liquid. In lieu of upgrading these sites with conventional separation equipment, three multiphase pumps were installed. This put the low-flowing wells back to production and as a result of the reduced wellhead pressure, a significant production increase was noticed. On of the latest examples for twin screw multiphase and emulsion pumps installed on an oil field with centralized processing is the Chad-Cameroon Oil Development Project (Esso Exploration and Production Chad, Inc.). The production from four different fields, with a total number of 14 pumps, is transported to the central processing facility by single flow lines. These are just a few examples of successful multiphase pump installations. With the increasing demands for oil gas and the desire to keep marginal fields longer productive, multiphase pumps find a large field of applications. The technology and the benefits of saving capital and operational costs are proven. In a changing world caring much more about existing resources and the environment, multiphase pumps are a quite unique tool which will gain increasing importance in future oil production.